This collection of sixty-one papers contributed by the scholars from India and abroad is in memory of Dr. H Sarkar who retired as Jt. Director General, Archaeological Survey of India. He is very well known for his invaluable contribution to the field of archaeology. The papers included herein are the outcome of researches done on art, architecture, iconography, epigraphy, numismatic, archaeological explorations and excavations, antiquities and museums, conservation and heritage management over the years besides reminiscences. Dr. Arundhati Banerji now a Deputy Superintending Archaeologist, joined the Archaeological Survey of India, for Post-graduate training in Archaeology (1972-73). Ever since she takes active interest and participation in all the branches of archaeology. Thought her keenness in the field of Epigraphy and Numismatics of early period, made her to pursue further studies in archaeology, she studied numerous antiquities preserved in different Museums and Central Antiquities Collection of the Survey. Her long association with the Survey, enabled her to study the stylistic evolution of various art forms particularly the terracottas. She was awarded Ph.D. (1990) for her work Terracotta Art of Northern and Western India from c. 2000-e00 B.C. 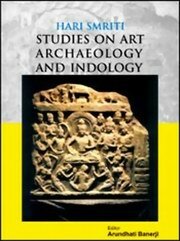 Besides many research papers, she has also contributed articles for “An Encyclopaedia of Indian Archaeology (ed.) A. Ghosh. At present, she is assiduously working for a monograph Terracotta Art of India on which she has already contributed widely in many Research Journals. She has also traveled abroad in connection with the Festival of India, Paris.